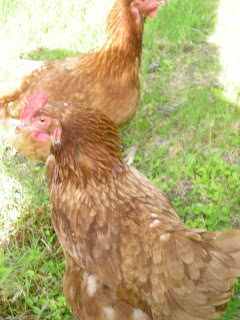 Living out in the rural area you find that you see a menagerie of animals. Starting with the chickens and the dog that is usually around everyday. But lately we have seen several other animals. Ones that we didn't get pictures of are a beaver heading for the river, a family of skunks crossing the on ramp to the freeway, a raccoon just off our road, a pair of vultures, a donkey walking down the street and a snake in the grass that I stepped on with my bare feet. We had a picture of a bald eagle in our tree but I couldn't find it right now. Following are the animals that I did get pictures of. I have yet to see a black bear but Jim promises that I will some day. We have a dairy down the road that makes the best ice cream and has bunnies, cows and pigs to pet. 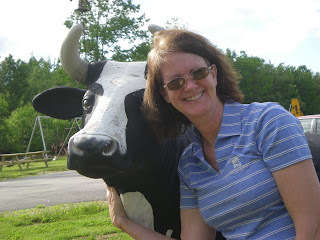 This is not a real cow but it was fun to be this close without the smell. This is Miss Piggy she wanted my ice cream I wasn't willing to share it with her. She really stinks and I didn't enjoy her touching me at all. 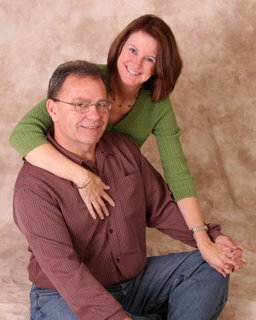 In fact I was watching Jim take the picture and she came up and touched my arm it startled me and I screamed. 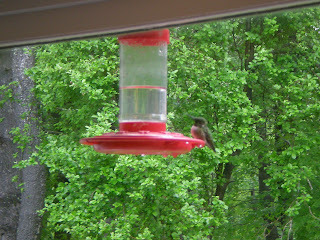 This is our Humming bird feeder. Jim says that by the end of summer they will be so fat that they can hardly fly. There are two of them a male and female. It is so fun to watch the come and eat. For those of you that would like the recipe for the humming bird juice it is 1 C H2O to 1/3 C of sugar. 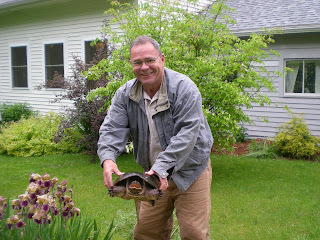 Every year for the past four years Jim has walked out of his front door and found a female snapping turtle laying her eggs. This year it looks like a different one but still we were walking out of the house and there she was. I loved the spinney tail. 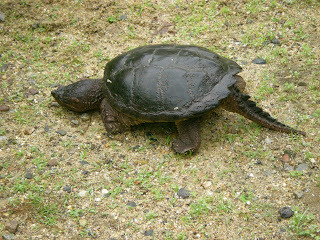 Jim tried to move her so she would not lay the eggs in the middle of the driveway she wasn't really happy with him. Notice how her mouth is open and she is ready to bite anything that will come close to it. As we were leaving our home the other day we saw a police car with its lights going and the officer out side of the car. 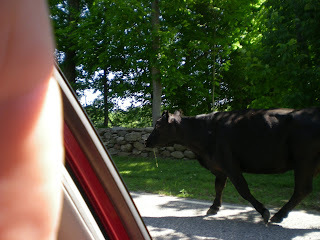 Then we looked a little closer and here came a cow walking down the road. Maybe it was going to fast or slow and the cop was trying to stop it. ;) The last animal that we saw and took a picture of is a baby porcupine. The mom was to fast crossing the road to get her picture but the baby was slow enough to get it just before it went into the woods. I am sure the before the summer is over I will find several more animals. We hear in the woods by our home moose, fisher cats, and bears. It is so fun to be here were nature is so close. 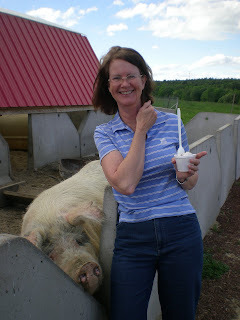 I wouldn't be too jazzed about the pig sharing my ice cream either. You do have quite the collection of animals out there, that's another fun thing about living in the middle of no where. I still don't think I would have touched the turtle but I bet Aaron would have. He's always picking up animals around here to show them to the kids.